NASCAR is bringing a unique twist to the NASCAR Gander Outdoor Series. 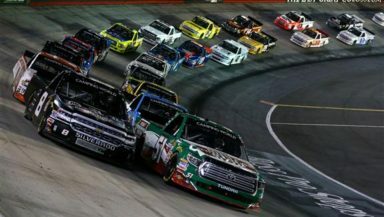 Announced on Monday, NASCAR will introduce a Triple Truck Challenge, almost similar to the “Dash 4 Cash” in the NASCAR Xfinity Series. Want your own dash for cash, check out America online casino for in-depth online reviews. The Triple Truck Challenge will span over three races beginning at Texas and ending at Gateway. The other race included is Iowa. Only Truck Series driver’s are allowed to compete in these races and be eligible. A driver has a shot to win up to $500,000 should they win all three races, that’s half a million. A $50,000 bonus will be given to the race winner for one race over those three races. Should a driver win two of the three races, they will receive $150,000. Also announced is the qualifying procedure. The rules will stay the same, but first round will be shortened to ten minutes, whereas in year’s past it was 15 minutes. This will take place for short and intermediate tracks. Session breaks are also shortened to give minutes instead of seven. Finally, NASCAR also announced they will begin teardown inspection at the track instead of the R&D Center as indicated in year’s prior. Should a driver fail post race inspection, the win will be taken away, the driver will be disqualified and lose all benefits such as points and stage points/wins. Everyone will move up in the final running order. The driver will end up finishing last. Each series will have their own dedicated officials in the garage area. The NASCAR Gander Outdoor Series takes center stage on Friday February 15th at 7:30 p.m./ET for the annual running of the NextEra Energy Resources 250 live on Fox Sports 1.